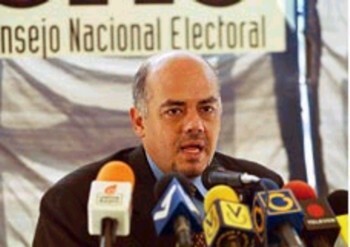 The director Jorge Rodriguez revealed that although the results of the cadastre ordered by the CNE (Electoral National Committee), that he chairs, showed a “clear imbalance” in the location of the voting centers – that works against the citizens of the popular zones “there is no enough time” to open new points for the presidential revoking referendum. Rodriguez informed in an exclusive interview, granted to the television transmitter Globovision, that, in order to correct the flaw, the electoral organism will make an educational campaign of information that will endeavour to obtain that “those subjects affected by the inequality may massively turn out” to exert their right to the vote. The director stated that there was a record of signing in the Permanent Electoral Registry that surpassed all the expectations, which means that more than 1.800.000 new voters will participate in the recall of the 15 of August. He said that the organism would dedicate itself in the next days to tune up the automation contract, the verification of digital tracks agreement, as well as to the imprint of acts, ballots and to improve the electoral schedule. The chairman of the Andean Electoral Council, Nicanor Moscoso, went to the office of the CNE and guaranteed that they will participate as observers in the presidential revoking referendum of the 15 of August. Moscoso met with the director Oscar Battaglini and, after the encounter, offered a press conference. He said in advanced that the institution will participate actively in the different phases allowed by the Venezuelan electoral council. Moscoso was in agreement with the regulation of observation elaborated by the CNE although he did not know his content. He is sure that the participation of the observers will make the process to be transparent and reliable.